Who Can Earn the CCS? See the steps involved in earning the CCS designation. Want to learn more? Download the CCS study guide here. 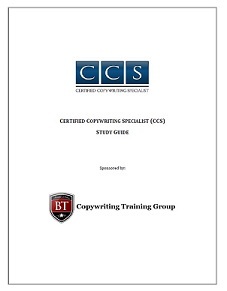 What sets a Certified Copywriting Specialist (CCS) apart? Read more. We are the only copywriting certification program to guarantee that you will get great value from completing our program. We offer a 100% money back refund if you do not find value in the CCS. Get started on your copywriting training and certificate program today for just $999 by completing our registration form. To learn why over 15,000 others have joined our training and certification program please read about the CCS Benefits . COPYRIGHT © 2017 COPYWRITING TRAINING GROUP. ALL RIGHTS RESERVED.